Tuesday was a strange day. I started the morning with a plan of action in mind, one which quickly unraveled. No wallet = no train ticket = an unplanned drive into Philly. Although the unexpected trip disrupted my plans it also presented an opportunity to spend some time listening to music and chatting with my son, which for me is always a treat. He’s always introducing me to music that I enjoy and never would have found on my own and we both enjoy talking about weird things. He often surprises me with food for thought and yesterday was no exception. “Mom, I saw a proverb this morning that I think you would really like,” he said. That immediately conjured up an image in my mind, one that I carried with me throughout the rest of the day and into the night. What I saw in my mind had to do with overcoming the power of self-doubt and flourishing as an individual. Of all the ironies, I misspelled one of the words. I crossed it out, wrote it correctly, and kept on drawing. Truth to be told, when I first started journaling I never considered drawing in it and I couldn’t complete an entry if I misspelled something. Rather than crossing out the word and continuing on I ripped out the page and started over. Over the past few years I’ve learned that perfectionism is the enemy of creativity and self-doubt is the fuel for limitation. I’ve come to believe that no one limits our growth more than we do ourselves. I chose to share this entry, not because it’s a beautiful drawing but because I hope it illustrates a point. No one is perfect and we all have doubts, we just owe it to ourselves to not let feelings of self-doubt keep us from becoming who we are meant to be. 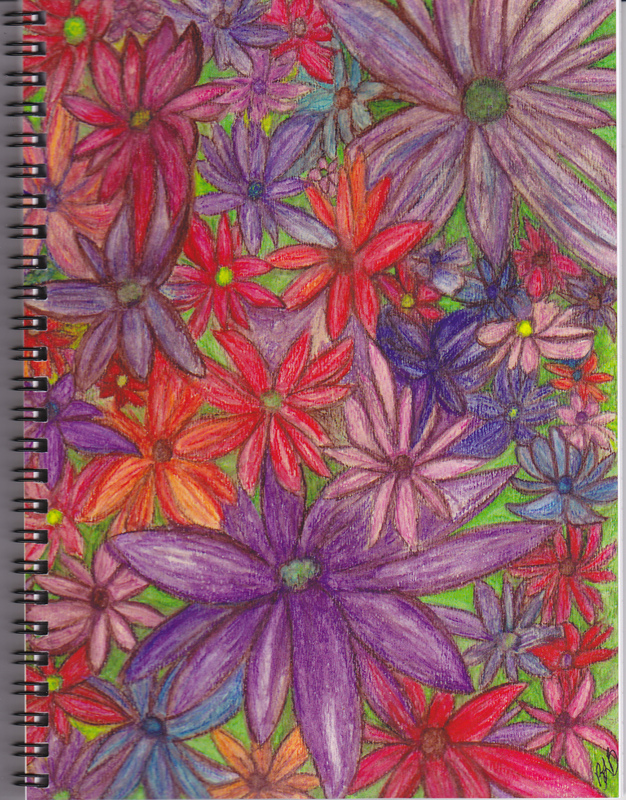 More and more often I find myself doodling in my journals in addition to writing. My mind starts to wander and all of the sudden my pen lands on the page opposite of my words and a form that must have been hiding in my sub-conscious starts to emerge. Sometimes the entries turn out to be very detailed and take a couple of sessions to finish. Other times they happen in one sitting. Don’t ask me how long they take, because when I start to write or draw I lose track of time. 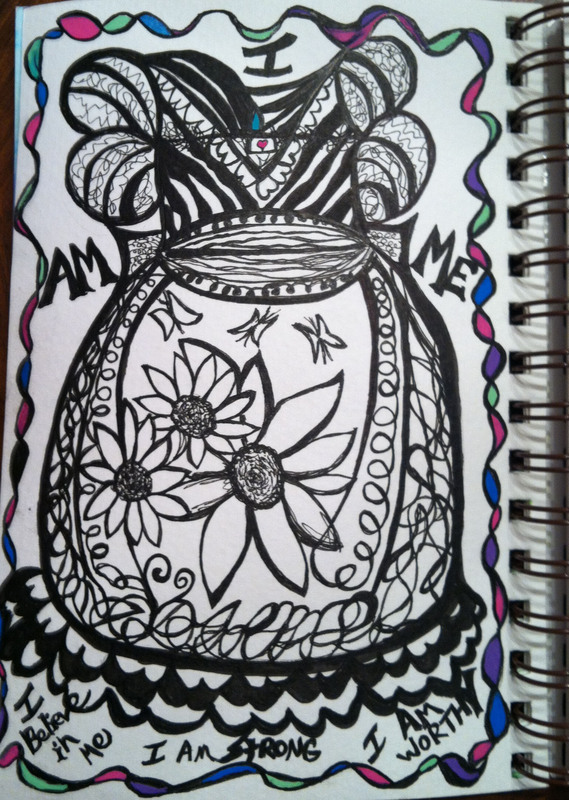 I doodle until I can’t draw any more and if it’s not finished, I return to it the next time I feel like it. I never would have guessed that drawing would become such an important part of my life, let a lone a way to unwind. 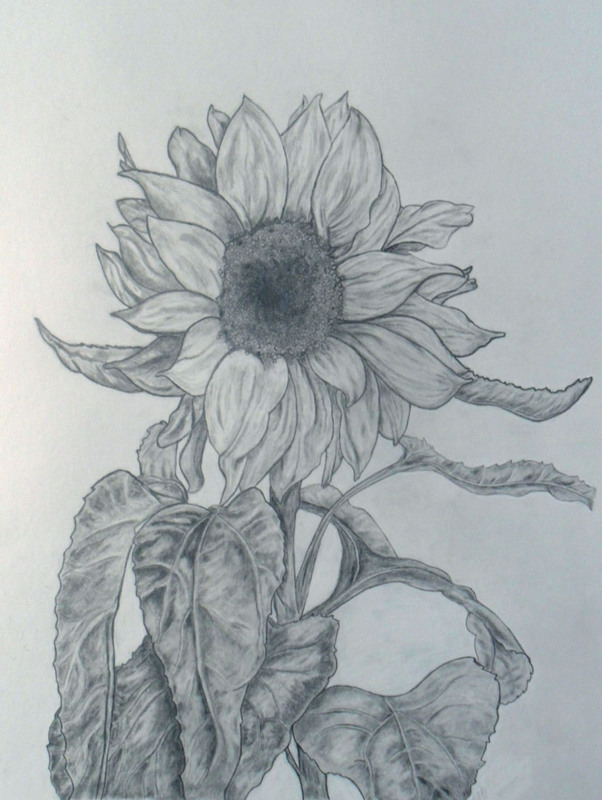 It seems like just yesterday that I mustered up the courage to attend a drawing class and spent months completing my first sunflower. It’s a little deceiving to post these images together because the drawings are completely different in scale. 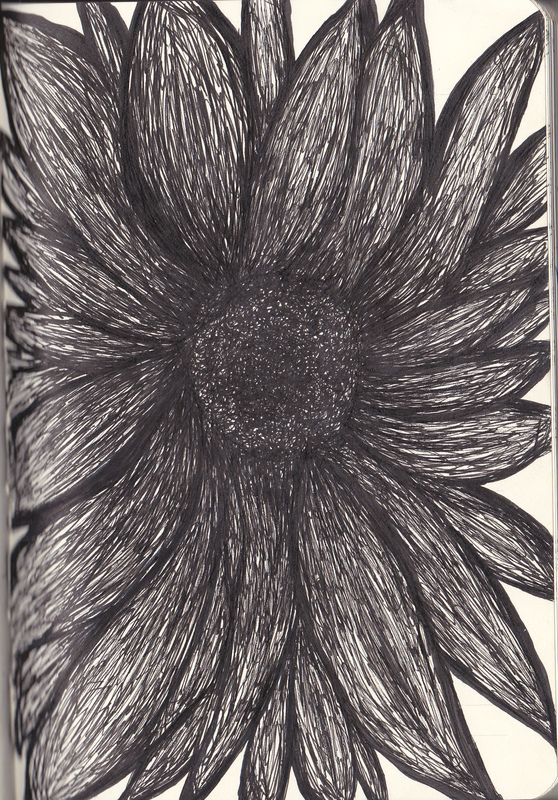 The sunflower from my class is easily 9 times larger than the individual journal entries. It’s also in pencil, not ink and was inspired by a picture in a lesson book not solely from my imagination. I also never would have guessed an online “doodle and lettering” class would help me gain confidence in my abilities and get in touch with my second-grade art girl. The thing that’s interesting to me is that I clearly have a “style.” I know that probably sounds strange to say, but it’s not something I ever would have imagined myself saying out loud. 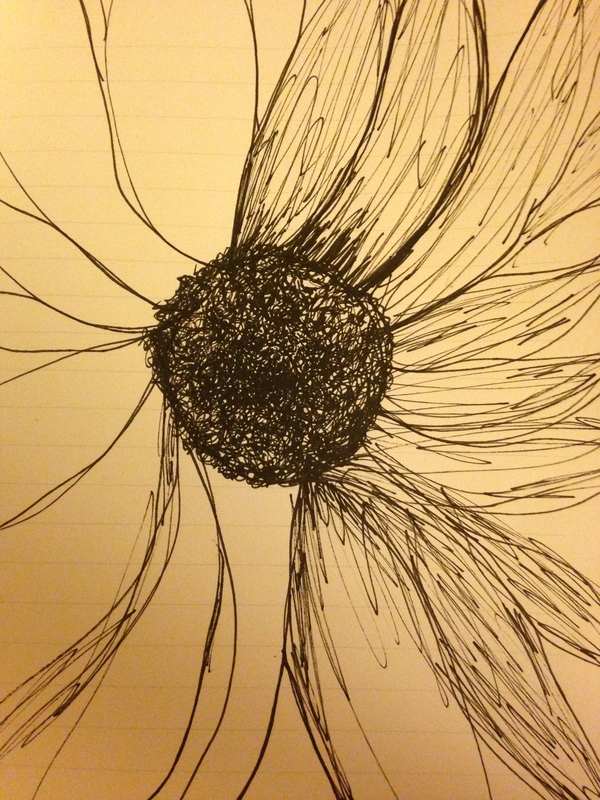 Sometimes I wonder if I should challenge myself more and move beyond sunflowers, trees and butterflies. They seem to dominate my art, but maybe that’s ok.
I’m enjoying the casual and non-stressful exploration of my creativity and some really interesting pieces of art are emerging. My recent affirmation art journaling project has resulted in two additional pieces of work that are completely different from anything I’ve done before (other than the fact that trees are the main subject 😉 ). 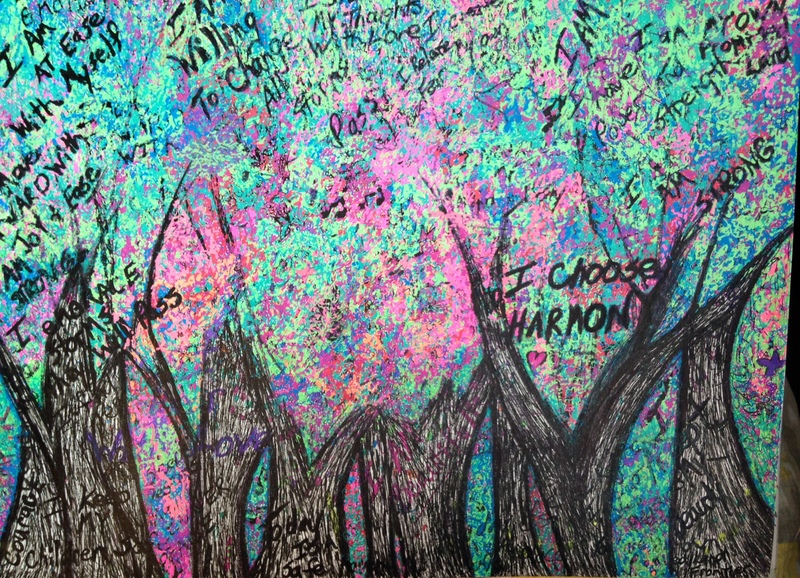 This “affirmation Forrest” grew organically as a result of the project. It began as a sheet of paper that I used to try the lettering of a phrase on for size and as a place to clean off the extra ink from a gel pen and doodle tree trunks. My latest project is a “rainbow tree,” for lack of a better description. 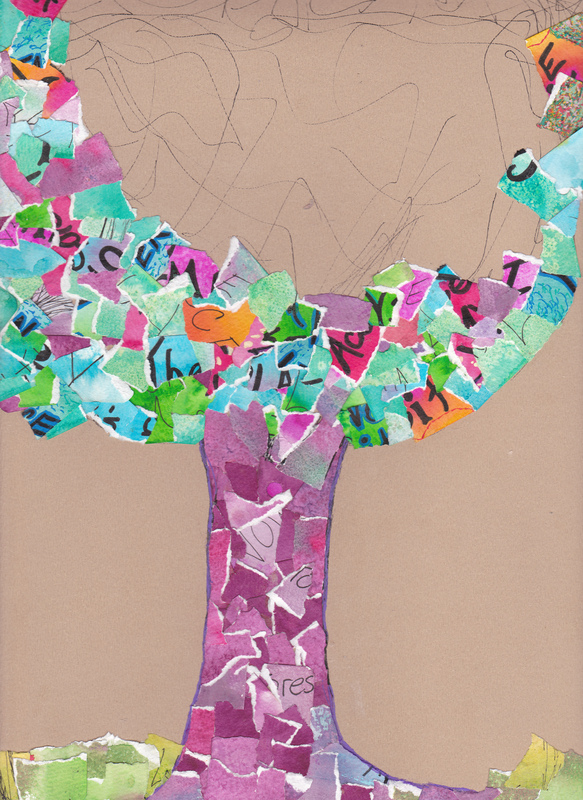 The tree is made up of tiny pieces of paper. They are actually “rejects” from backgrounds I created while working on the affirmation journal. 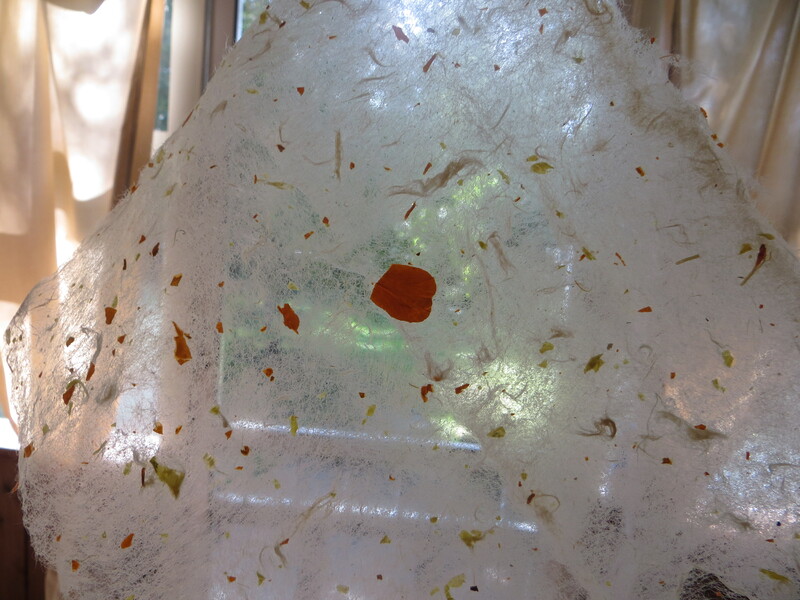 Initially if something didn’t work, I tossed it – then one night as I was tearing one into little pieces it occurred to me that there might be a creation hiding in them, so I started saving them, and voila! It’s still a work in progress and I can’t wait to see how it turns out. Occasionally I wonder if I’d be “further along” with my art if I’d continued taking more formal classes on the other hand I can’t help but think that some of my more recent efforts never would have happened if I had. It seems my definition of being an artist is evolving and I’m learning what it means to me. Some day I may return to the classroom setting, but for now I’m going to explore my creative side in my own way and in my own time. A couple of months ago I was asked to speak about Google Plus (Google’s social networking platform) at a conference for Freelance Medial Writers. I was really flattered about the opportunity and last Saturday was the day. I took the train even though the hotel is a mile away from the airport. I like to avoid the stress that comes with driving on I95. It seems I almost always learn something new and I now know that the cabbies at the airport won’t give up their spot in line to take someone to any of the nearby hotels. It also turns out that calling the hotel to arrange for a shuttle works better than running down the sidewalk trying to catch the one that passed right by. I was both excited and nervous when I stood up to speak; I teach workshops on a regular basis, but it’s entirely different to stand in front of a room of people holding a microphone. It went well overall and people enjoyed learning about the platform and my experience with it. By the end of the afternoon I was tired and anxious to get home. My plan was to catch the 5:15 train back to Yardley. I missed the first shuttle and the next one was late, which meant I had to take the 5:43 train into Center City and catch the 6:40 train home. Because of the delays I ended up with a traveling companion, a woman who had attended the conference. She was headed to Trenton and I helped her maneuver the airport logistics and read the train schedule. I convinced her to get off at Market Street instead of 30th Street because it’s a much nicer train station and she’d still be able to catch the right train. I was right about the first part, it is a nicer station. As for the second part, I knew that the Trenton Line has departures from the Market East Station because I took it once by accident. What I didn’t think about was that even though the trains leave from different platforms it was impossible for both of them to leave at the same time. Thankfully my new friend turned out to be a plan B sort of person and chose to laugh about the situation and make the best of it. It’s funny how sometimes you meet a complete stranger and within minutes feel like you’ve known them for years. Long story short, I deleted my active profile instead of my abandoned/duplicate one. This may not seem like a big deal, but I was devastated. Google Plus has become an important part of how I share content I write for my business blog and it’s been an amazing place to network and generate opportunities. I can’t repeat what I said, but there was nothing kind about how I described myself after I realized what I’d done. Words like stupid, idiot, and failure followed me around all day. “How could I,” “why didn’t I,” and “I should have,” started nearly every thought that went through my mind. I spent the day doing as much damage control as possible and accepted the fact that I was going to have to start over and make the best of the bad circumstances. I couldn’t help but think about the irony of the situation. Less than 48 hours after speaking about Google Plus as an “expert,” I did the unthinkable and deleted my account. I see the humor in it now, but I can’t say I did that day. 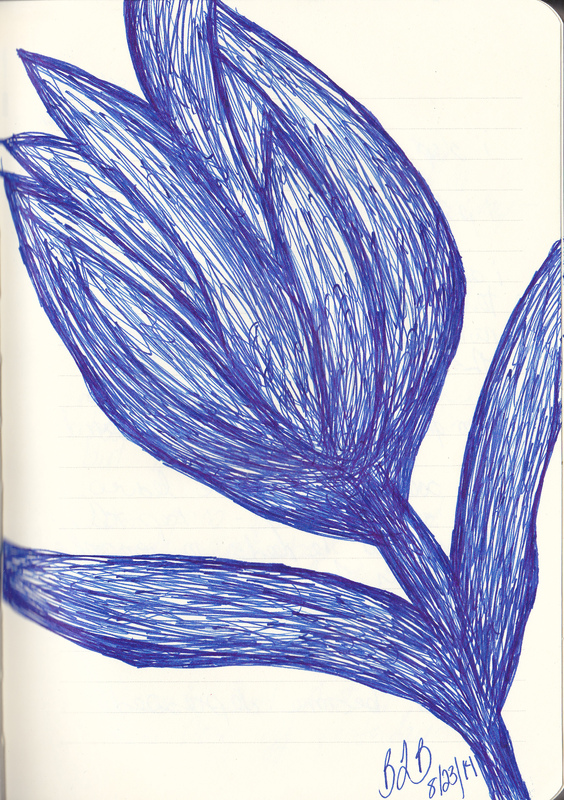 As I often do when something happens, I took out my journal to write about it. I find writing cathartic and it helps me work through the emotions and move on. That night the negative self-talk continued until I thought back to my traveling companion’s parting words. The answer was clearly no. If my best friend had done the same thing, I would have given her a hug, let her cry, and reminded her that she is smart, beautiful, and lovable. I’d have taken her hand, helped her put things in perspective, and come up with a plan. 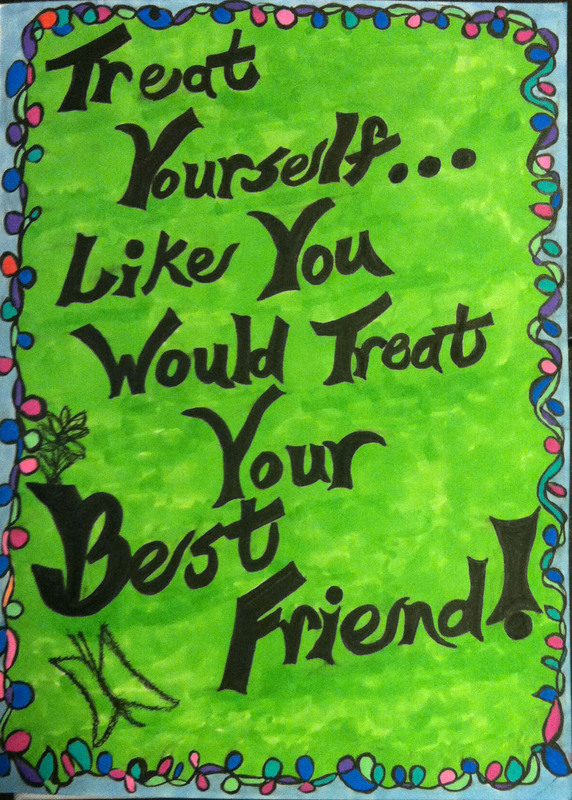 The phrase, “Treat yourself like you would treat your best friend,” replaced the negative self-talk. It should come as no surprise to me that when the negative thoughts were replaced with kind ones things didn’t seem nearly as bleak. The real point of this post is this – we all make mistakes and they are recoverable. Remember to be kind to yourself and sometimes you need to be your own best friend. I can’t believe it’s been almost a month since I have written here. I knew starting my own business was going to be hard work, but I didn’t quite comprehend how consuming it would be. I’ve had some funny experiences that someday I will have to write about. Everything from my computer crashing an hour before my students arrived to the dogs barking hysterically in the final minutes of a webinar I was recording. It’s been a crazy learning experience and for the most part it’s also been a lot of fun. I’ve been very fortunate and have accomplished a great deal in a short amount of time and the future looks promising. I’ve realized it’s time that I put some balance back into my life – all of the hard work I did last year discovering that I am an artist and how important it is to have balance needs to come back into play. To that end, the first thing I have done is put exercise back in my life. 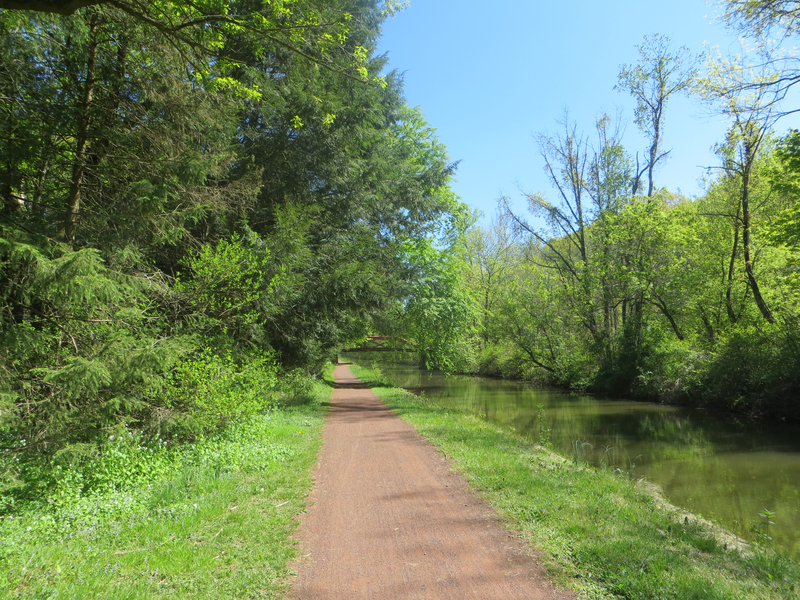 It’s been great to get out on my bike and travel along the towpath. I’ve also been making it a point to try and rekindle my creativity and ‘artsy’ nature. I’m still struggling with what to draw. 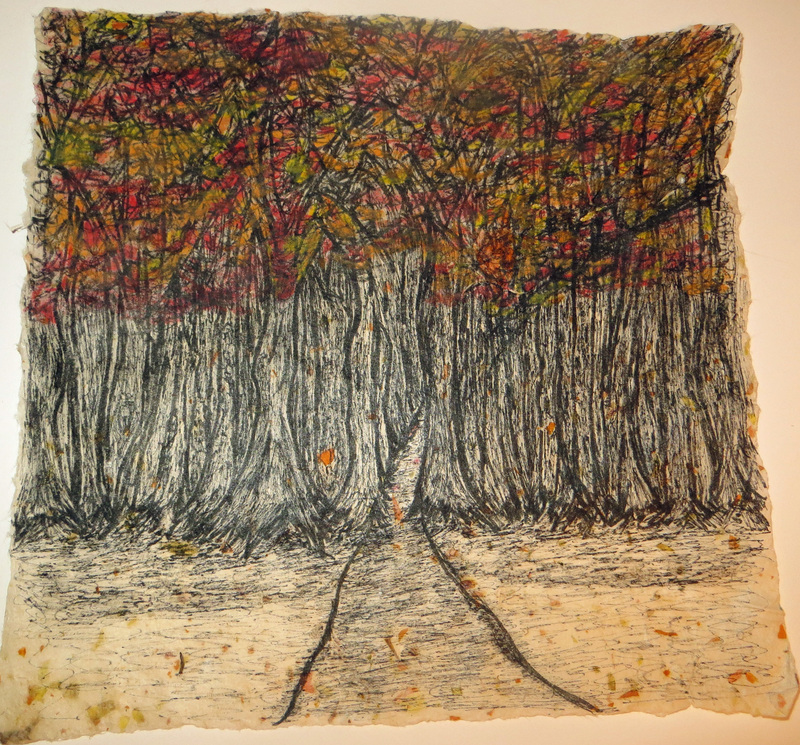 After finishing all of the abstract ink pieces on handmade paper, nothing has really inspired me. Maybe it’s time to consider taking another class, although that will have to wait until fall for a variety of reasons. 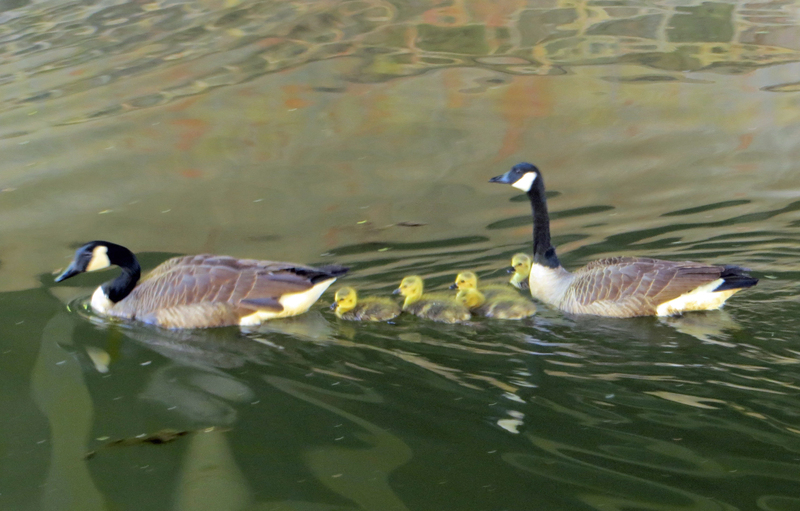 My camera is back in action and I’ve captured some great shots along the towpath. 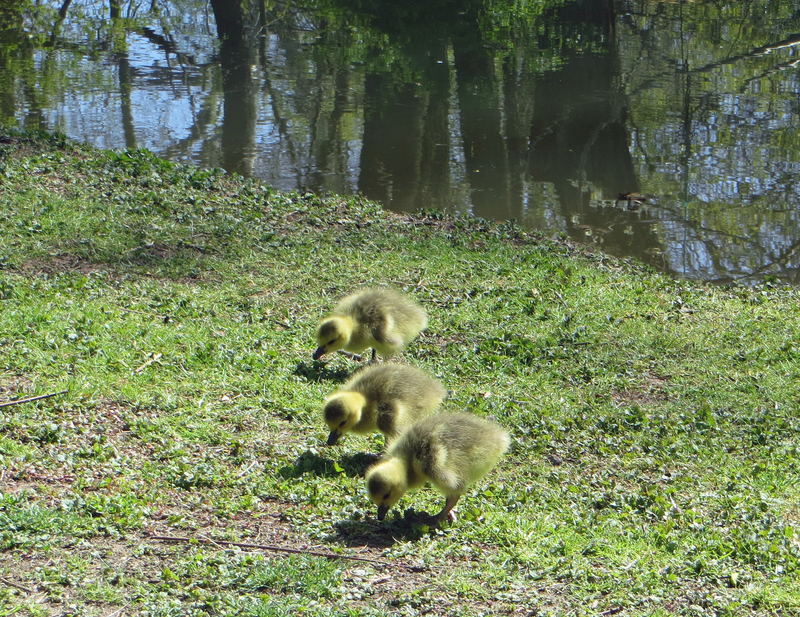 As much as I can’t stand geese, I have to admit these little ones are cute. They were so kind as to line up in a little row for me so I could take a picture. Yesterday they were learning to swim. I felt much safer taking pictures of them swimming than on the ground; somehow the hissing from the grown ups wasn’t quite as scary coming from further away. There are many people who live along the canal that have canoes. 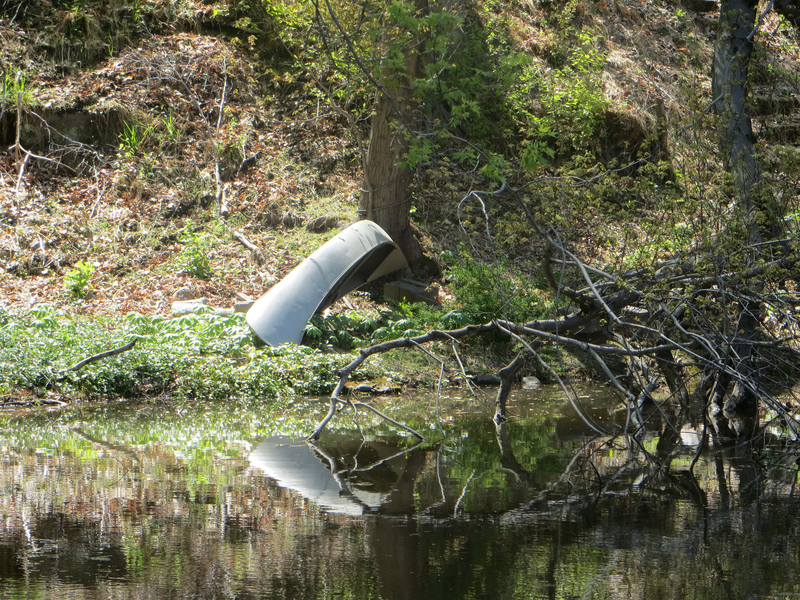 I took pictures of every canoe along a six mile stretch of the towpath. Perhaps that’s an idea for another blog post. 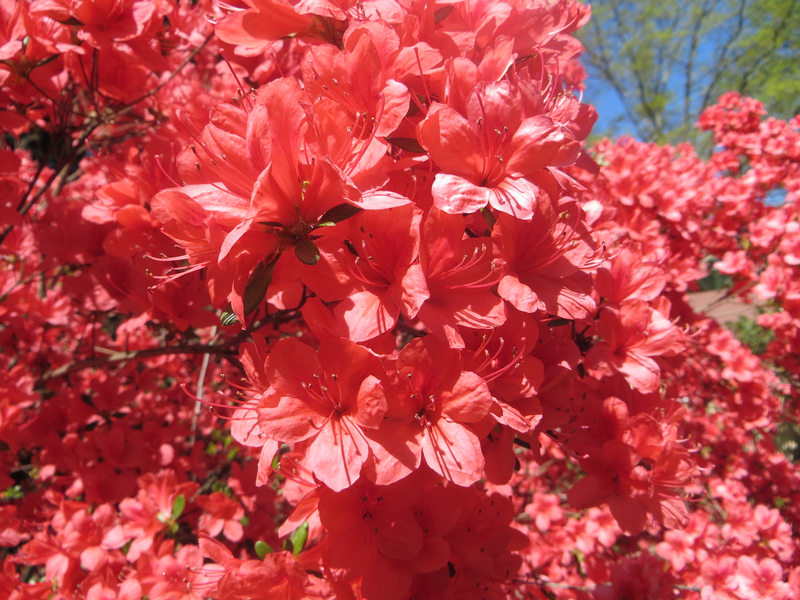 I never get tired of the breathtaking, brilliance of spring. The pinks seem to be extra pink this year. It’s only when you pause for a moment and actually take things in that you realize that there must be a million different shades of green. It feels good to be back to exercising and taking pictures again. I think it’s time to get back to making the time to do some personal writing as well. I’m a “one thing leads to another” kind of person, which can be interesting when it comes to explaining my train of thought sometimes. 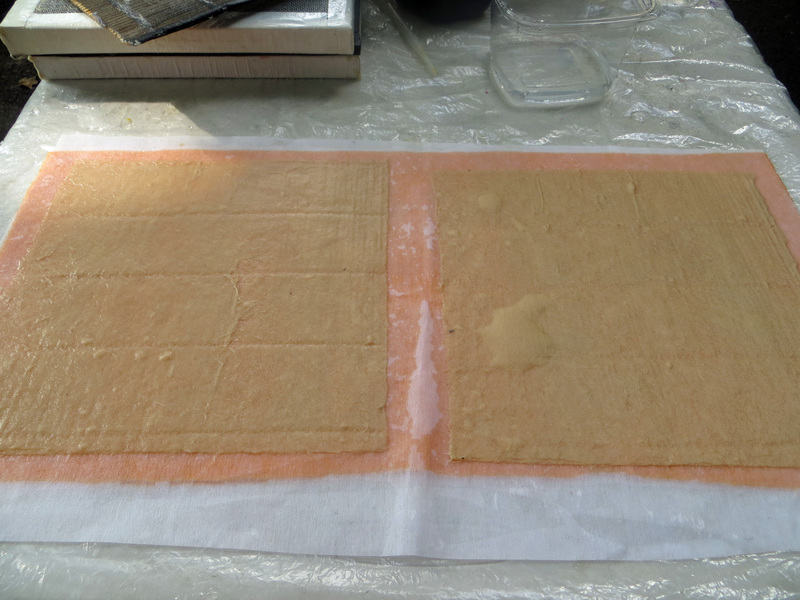 It might be hard to explain how an online class through a community college called Romance Writing Secrets would lead to drawing, making handmade paper, and not last or least to a workshop on making books. There is a connection, but it would take a book to describe it – so instead I’ll stick to my most recent adventure. Last Saturday I roped my friend Christine into taking a workshop at the Janney house through the Artists of Yardley. My friend and instructor Kathy and her fellow artist Mindy offered an all day workshop that was split into two parts; the art of making paper and of making books. I arrived 5 minutes late, but with coffee from WaWa in hand – an important tradeoff. I have to admit it was fun to show some of my paper and the drawings I’ve done. It’s such a thrill for me when people say “wow, I really like that.” I don’t think I’ll ever get over it, I hope I never do. Because I’ve had the opportunity to make quite a bit of paper lately, I asked if I could spend the day with Mindy making books. As always, the atmosphere in the studio was conducive to learning, laughing, and creating. We learned how to make two styles of book, accordion and flag. The accordion is easier to describe; paper folded in a “mountain, valley, mountain” pattern ready for pictures or drawings and secured between two covers. The flag book is much like a pop-up book and I think the possibilities are endless (once I wrap my head around how to approach creating the finishing touches). Mindy is an amazing teacher and it’s easy to understand why she and Kathy are friends. The dynamics of the morning and afternoon sessions were as different as night and day and Mindy never missed a beat. I watched in amazement as she adapted her style to the needs and pace of the students. I usually try and describe the process at least in a general sense, but book making has a lot more steps and detail than what I’ve been doing lately and I’m sure I wouldn’t do it justice. I was a little intimidated by the need for measuring and precision, but Mindy put me at ease and I was pretty sure she would find a way to fix almost any mistake I might make. What I think is interesting is how everything I’m attracted to has to do with paper. Writing, photography, and drawing are all done on paper. Somehow everything I’m learning is weaving its way together. It’s really quite fascinating when I take a step back and connect the dots. I have no idea how I’ll put this all together. What I do know is it will be a lot of fun to figure it out. The books I made last weekend are wonderful experiments. There are supplies on the way to create pieces that match my style and taste. The entire process has made me stop and think. The thought that keeps popping up in my brain is how we are depriving today’s youth. Our education system is focused on activities that require the ability to memorize and calculate, not on the ability to perceive and create. How can one exist without the other? Although there were some who predicted that personal computers, email and the internet would make the use of paper obsolete – that hasn’t been the case; at least not in my life. True, I get less and less paper mail but it still seems to be everywhere. Prior to yesterday I considered paper to be utilitarian and an instrument of my art only as it relates to printing out a page for an old-fashioned review or something to sketch on. I may have stopped to admire pretty notepaper or enjoy the texture of pages within a leather-bound journal, but I never gave a second thought to the process. Why does some paper ‘feel’ different than others? Where did the flecks of color come from? 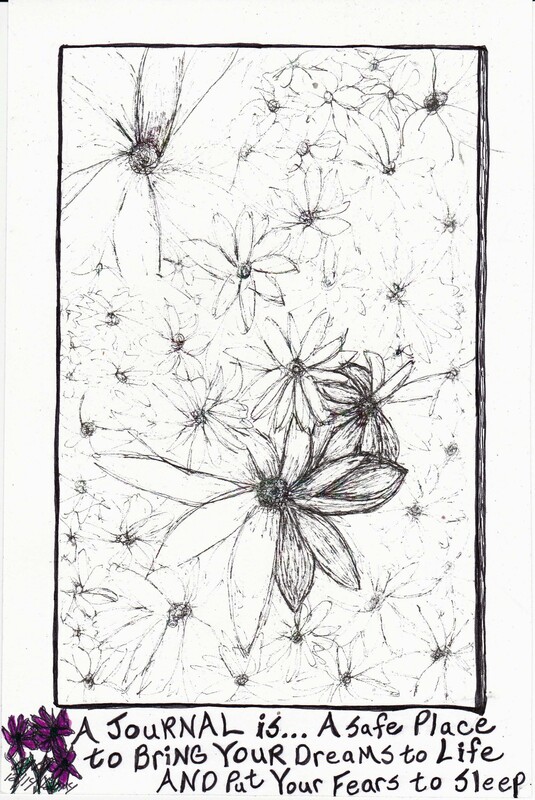 Over the weekend I received an email from my friend and artist Kathy. 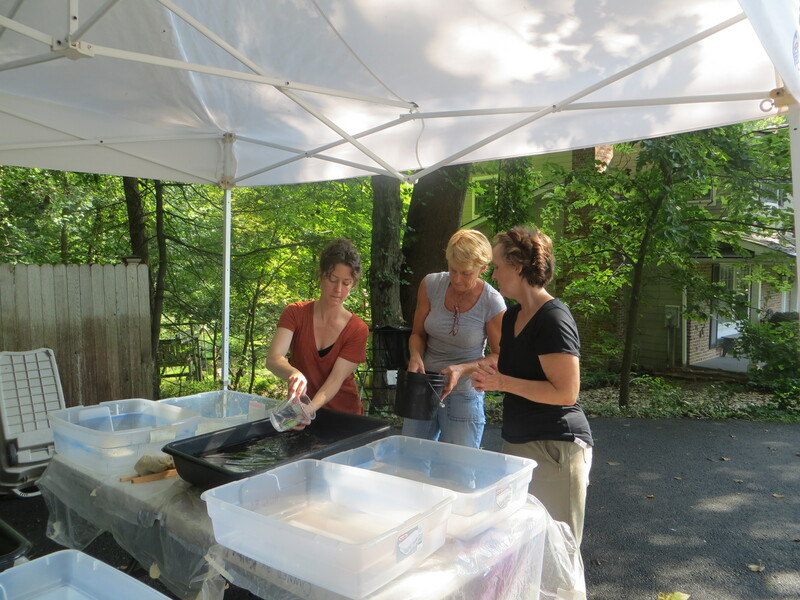 Due to a surplus of various kinds of pulp, I am holding a couple of papermaking open studio sessions and papermaking classes at my studio. 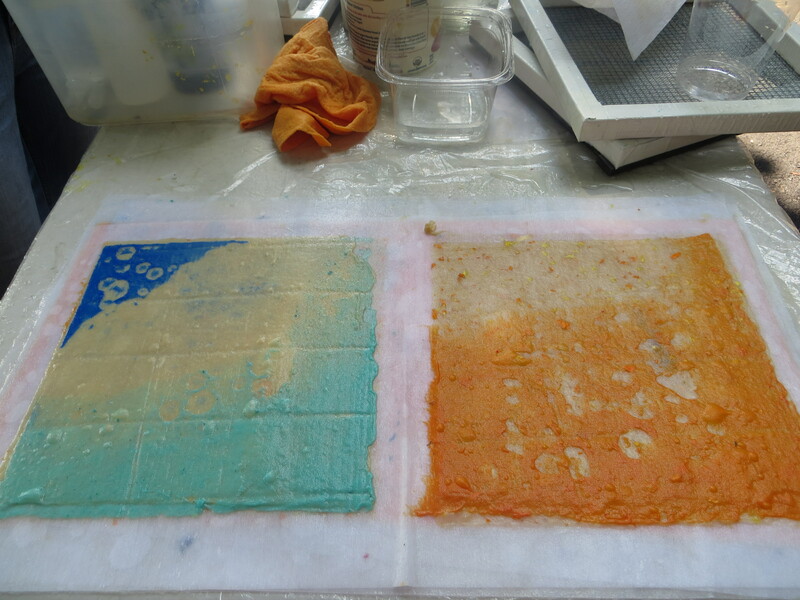 I have Japanese pulp, casting pulp, high shrink flax, abaca and pigmented pulp for painting. I jumped on the opportunity. I didn’t know much, but based on my breakfast conversation with Kathy a few weeks ago, I knew I wanted to learn more. I joined two other lovely ladies in Kathy’s studio for preliminary instructions and introductions. We helped carry out buckets of pulp while learning about the qualities of the material we’d be working with. Kathy showed us beautiful examples of her work and how a single piece of paper can stand on its own as a work of art as well as how it can be used to create sculptures and paintings. The possibilities are endless. 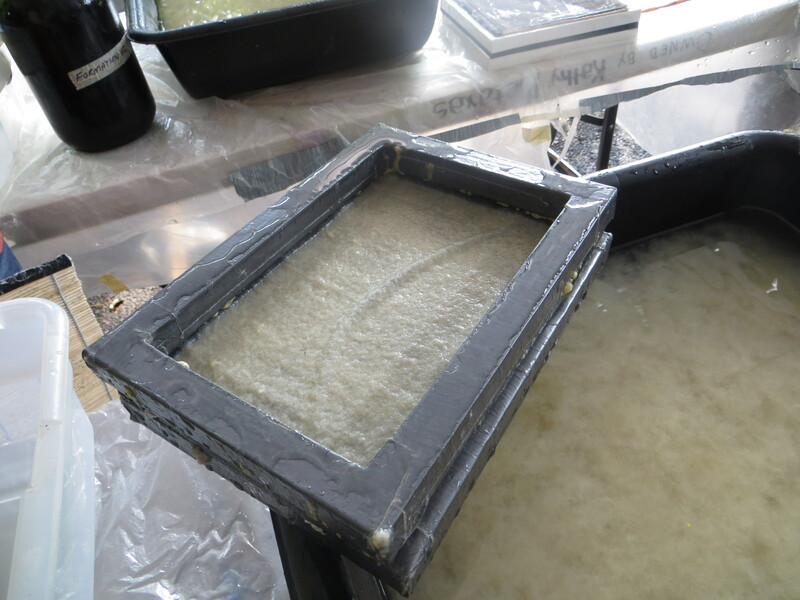 I took pictures and listened intently as she described the process of beating the plant fiber and immersing it in water in preparation for the process of making paper. It was hard to imagine how the tan spongy substance floating in a yellow bucket would transform into anything beautiful. 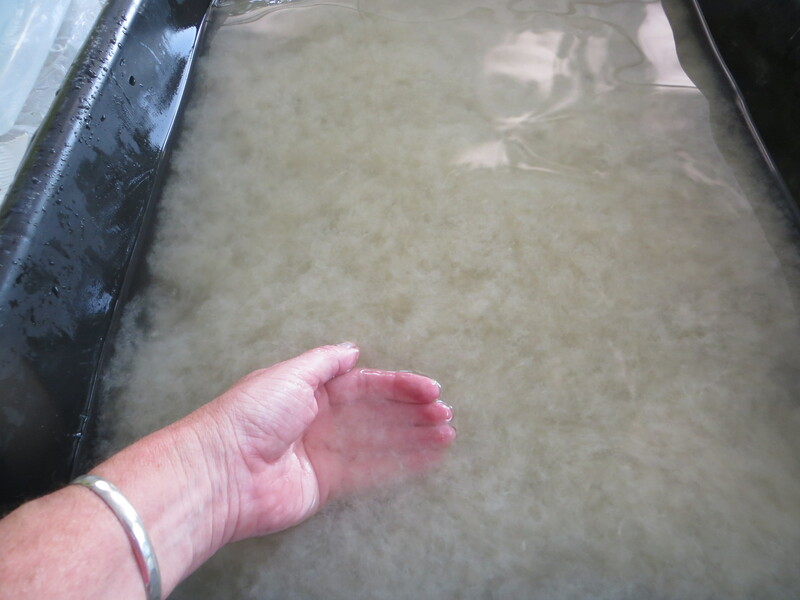 She walked us through the steps of adding the thick, gloppy pulp from the bucket to a tub of water and mixing it into a smooth and soft sea of fibers that would become a sheet of paper. “How do you know when you’ve added enough pulp?” I asked. I slipped my hand into the cloudy water and let the feathery pieces of fiber sift through my fingers. I don’t know how to describe it, but the water felt soft and alive. Kathy demonstrated how to put the mosquito netting over the screened frame and the best way to hold it in place with a second frame. Step by step she walked us through the process. She removed the top frame, lined the screen up with the edge of a wet shammy, and hinged it forward to release the fragile sheet of wet paper. Little by little she rolled the mosquito netting back and revealed a form that, when dry, would be a beautiful piece of paper. I was surprised, but it didn’t take me long to catch on and before I knew it I had two sheets of future paper and couldn’t wait to do more. We took a break halfway through the morning to enjoy fruit and chit chat. 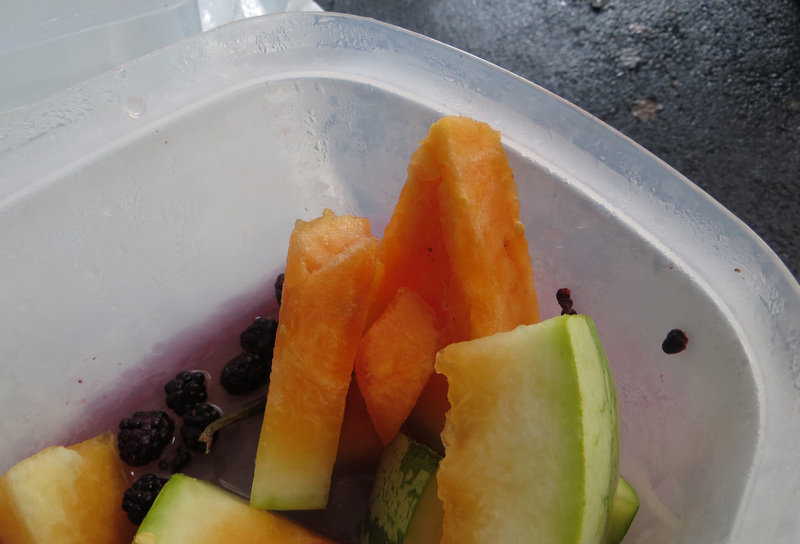 We gobbled up blueberries and a refreshing organic and beautifully orange watermelon. After the break, Kathy added blended pieces of marigolds to one of the vats and added pigmented pulp to three open tubs to create pools of orange, blue, and green. She showed us how to make a base sheet and then add a layer of color. I couldn’t decide which part was my favorite. It was a toss-up between trying to scoop up the pieces of petal from the marigolds and spreading water drops with my fingers to make a design. 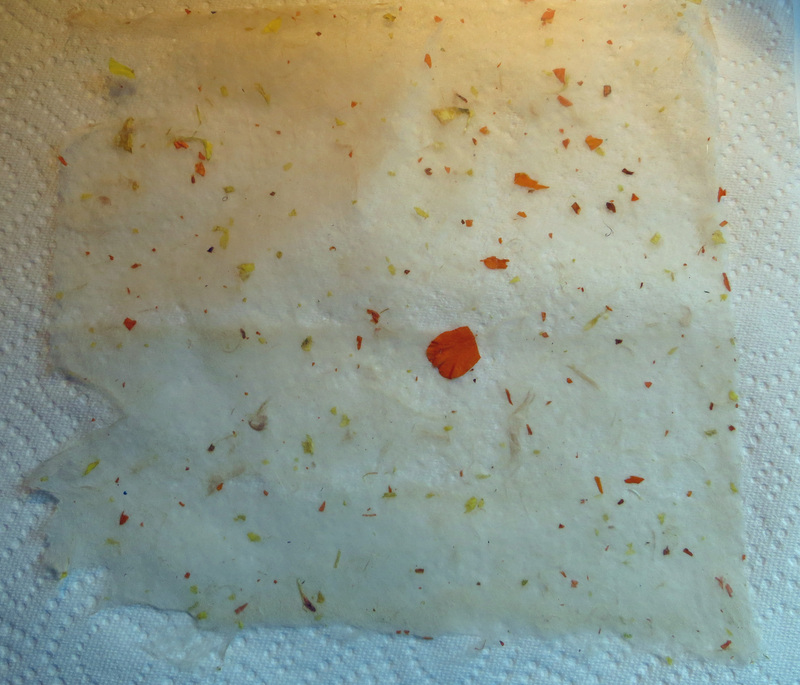 So of course I found a way to combine them both and created beautiful orange and blue designs to accentuate the natural beauty of the pulp and bits of flower petals. The morning flew by and our time was up before I knew it. It hadn’t occurred to me, but paper requires time to dry. Kathy showed us what to do and sent us home with detailed instructions. 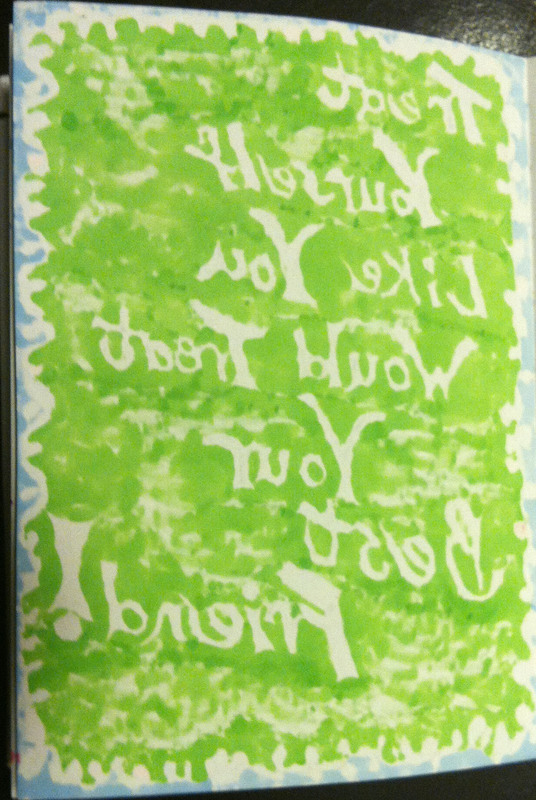 Of course, me being me, I had to try the quick method of drying on at least one sheet of paper. I was way too impatient to wait a whole week to experiment. I picked one of the less than perfect pieces out of the bunch and laid it on my kitchen counter. I knew it was thin and fragile and had more than a few flaws. I selected a paint brush with soft bristles and carefully stroked the moisture out of the paper. It came to life before my eyes. It won’t be a sheet I can draw, paint, or print on. 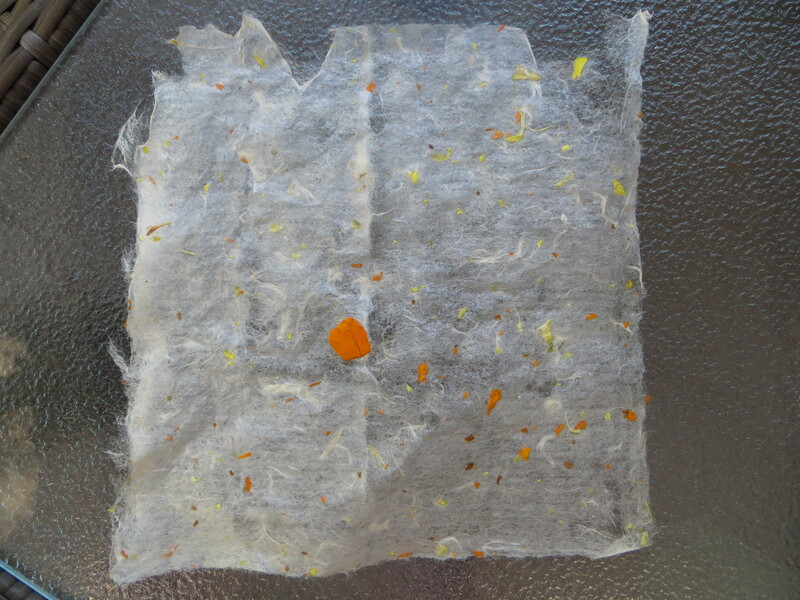 The edges are frayed and uneven, it’s thinner than paper thin, and the webs of fiber barely support the splashes of marigold. In my eyes it’s beautiful and it’s perfect in its imperfection.